Offer that you can't resist! 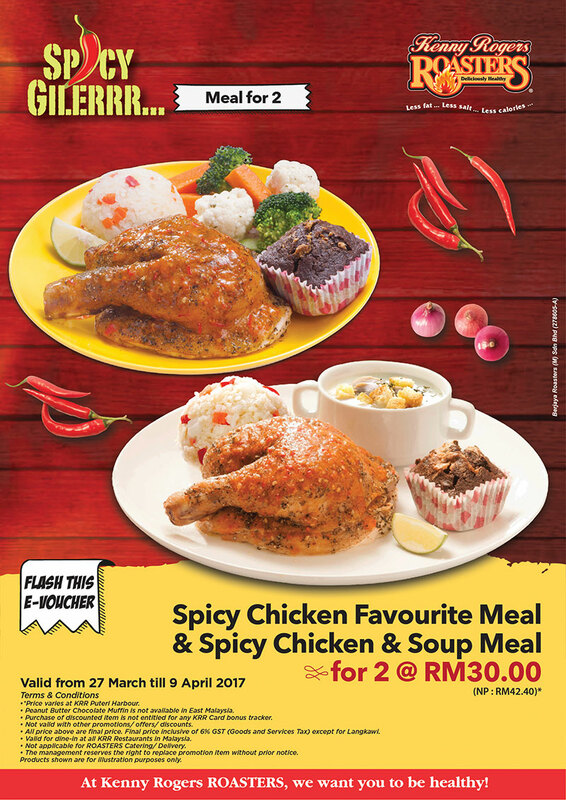 Flash this e-Voucher and enjoy combo for 2: Spicy Chicken Favourite Meal & Spicy Chicken Soup Meal @ RM30 only! Price varies at KRR Puteri Harbour. Peanut Butter Chocolate Muffin is not available in East Malaysia. Purchase of discounted item is not entitled for any KRR Card bonus tracker. Not valid with other promotions/ offers/ discount. All price above are final price. Final price inclusive of 6% GST (Goods and Service Tax) except for Langkawi. Valid for dine-in at all KRR Restaurants in Malaysia. Not applicable for ROASTERS Catering/Delivery. The management reserves the right to replace promotion item without prior notice. Products shown are for illustration purposed only.